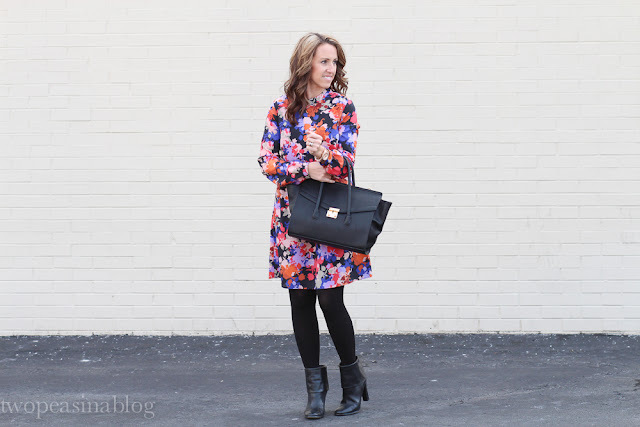 Another winter floral print dress. I just can't seem to stop wearing floral dresses lately. Remember this dress? I still love it! But this dress is just as fabulous. I can't get over the long sleeves and high neck, I think they are what make this dress so special. I can rock it with tights and booties now and then with a simple wedge or sandal this Spring. So which did you watch last night? The Bachelor? or The Grammy's? I watched The Grammy's. Confession...I don't watch The Bachelor. I'm probably one of the only bloggers who doesn't, but it's just not my thing. The Grammy's were really good. How about that tribute to Lionel Richie? So good, the songs from my youth!!! What was your favorite performance? 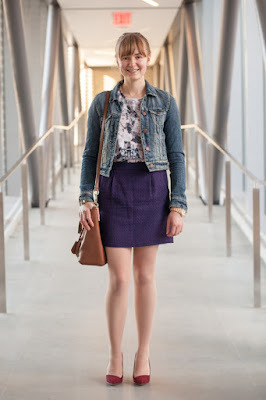 This week's feature blogger is Alecz from For Seven Seasons. 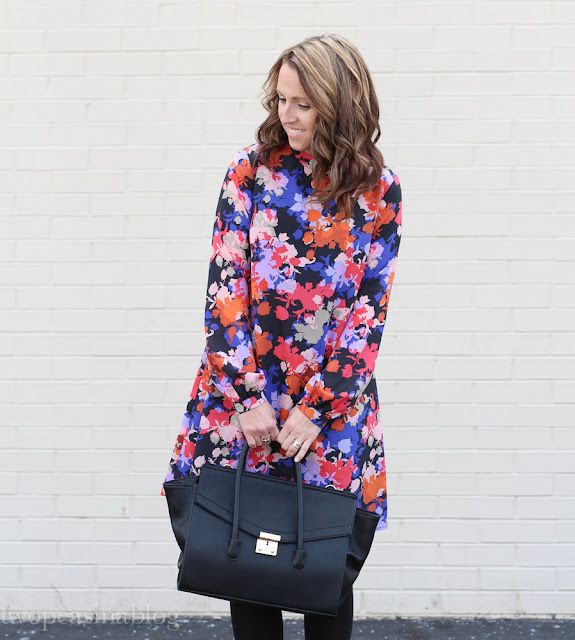 Her blog shows women how professional clothing can be "affordable, fun and classy". We love this look of girly florals paired with the denim jacket! 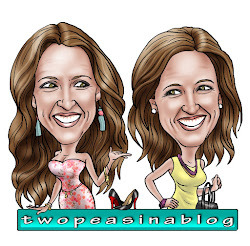 Make sure you check out her blog for other great inspiration. Confession: I am not a fan of The Bachelor either! I am a fan of that gorgeous dress though! Pretty colors! Thanks Jalynn. Glad you stopped by. I just love your dress! And no, your not the only blogger who doesn't watch The Bachelor; I don't either. I can't understand at all it's popularity, it is such a sexist show to me and so degrading to women. I just don't get it. Amy, glad you stopped by for the link up. Yes I don't understand the popularity of The Bachelor either. It's crazy! Kelsey, thanks! It's a fun and bright dress. 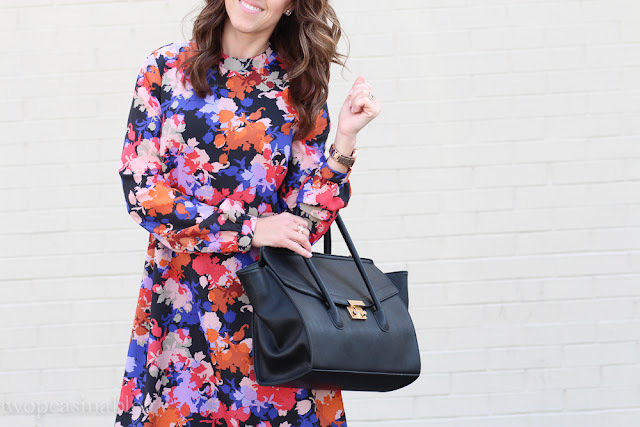 Love this beautiful floral dress on you, really makes me want spring to come!! I know, Spring can't come quick enough. Thanks for stopping by. 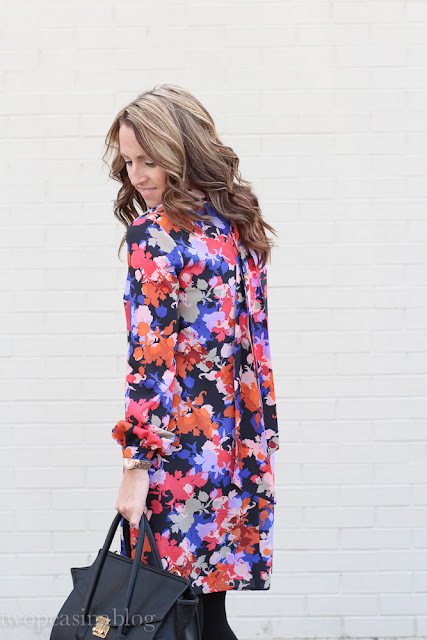 I love the colors and floral print of this dress! I have to admit, I don't watch the Bachelor either. So it was the Grammys for me! Thanks! The bright colors are what makes this dress so fun! The Grammy's were really good last night!! I love your dress!! The colors are so pretty! Love the hint of Spring in this dress - Have a great week!!! Wow, great tote! I can't believe it's Forever 21! What a great dress! I love the pretty colors against the black. I am not into the Bachelor either! Loved the Grammy's! Totally entertaining this year. Obsessed with this look! I need your boots! Such an adorable floral and I love those booties! I absolutely love this dress! The pattern and higher neckline are so beautiful. What a stunner dress! Obsessed is a understatement. You just look so stinking cute in it. Such a fresh look even with the tights. 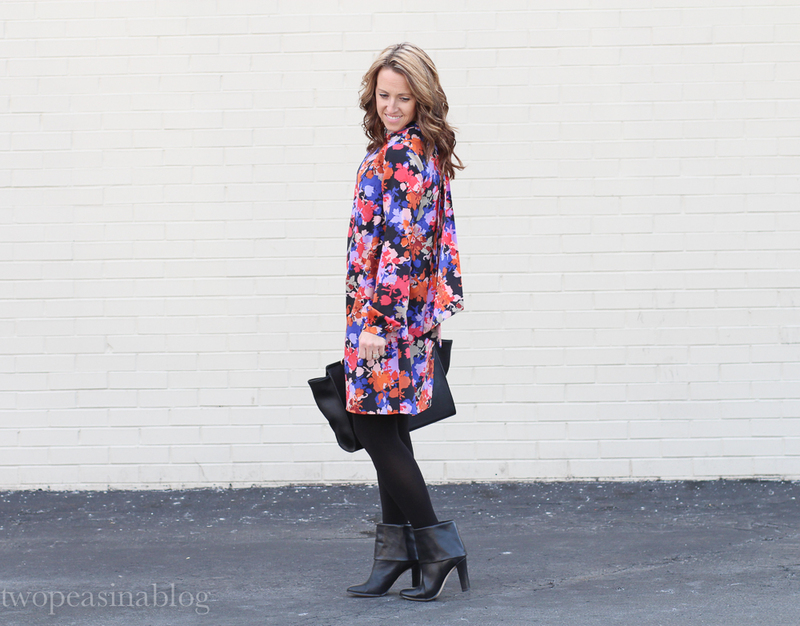 I love seeing ideas for how to wear floral in the winter. 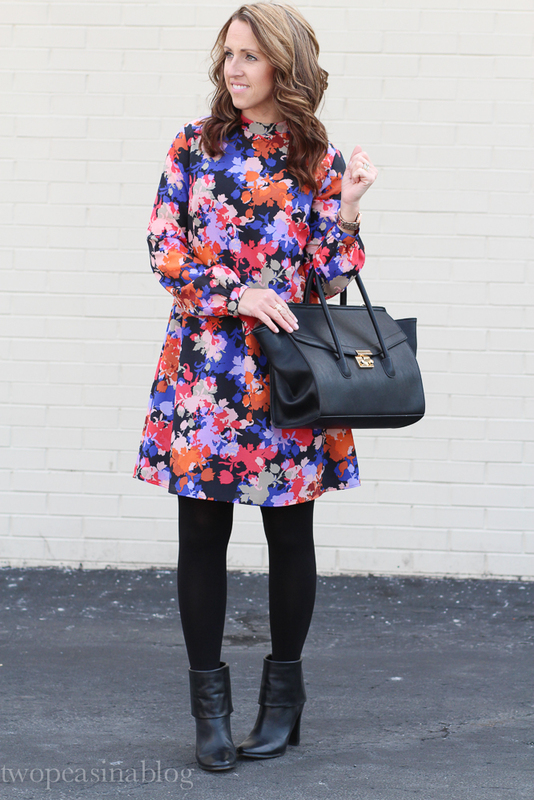 This look with tights and ankle boots is gorgeous! 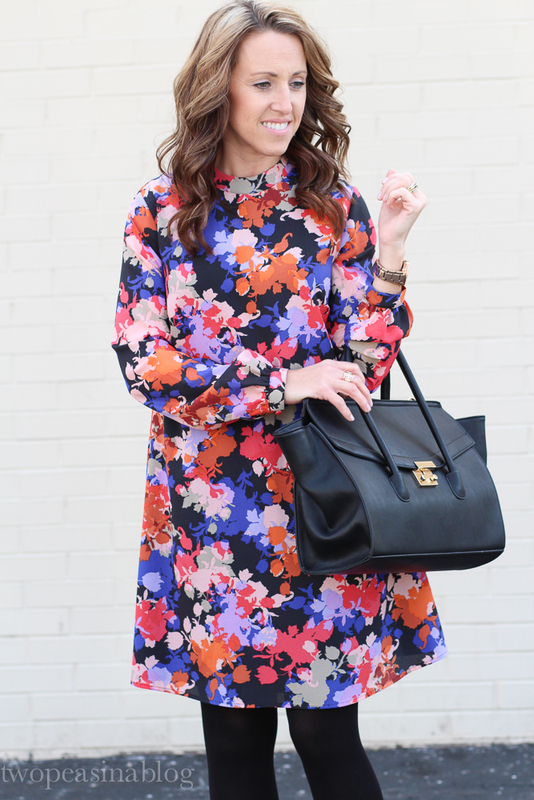 Beautiful dress, perfect for spring transitioning. Stunning dress I love the floral pattern so fun! I love black and this winter I wore a lot of black, but seeing all those great colours makes me think I should ad a bit more colour to my outfit! You look great in that dress! 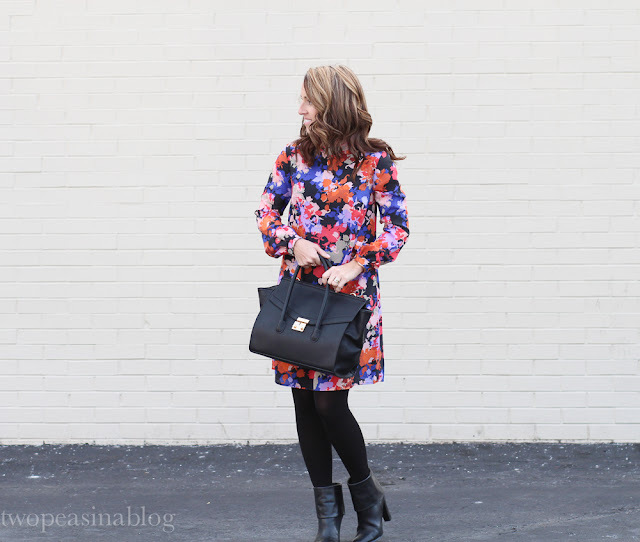 I just love the print on your dress and that bag is too cool! Beautiful printed dress on you. I watch the bachelor on occasion but not a big fan of it anymore..its getting quite boring...lol! I saw some of the grammys but missed Lionel Richie..he is my all time fav...bummed! Your dress is just so cute...I cant pull off big florals..but you do it effortlessly, so pretty! !